Lisa began her yoga journey 15 years ago when she was introduced to yoga under the teachings of Erich Schiffmann. As many do, she was seeking to increase flexibility and considered yoga a physical practice. After years of a consistent practice she became drawn more to the enriching effects it had on the mind and heart as well as the many wonderful transformations that were happening. These transformations were not just on a physical level. They were expanding her mind, heart and spirit so much that she felt an unwavering desire to share this awakening with others. 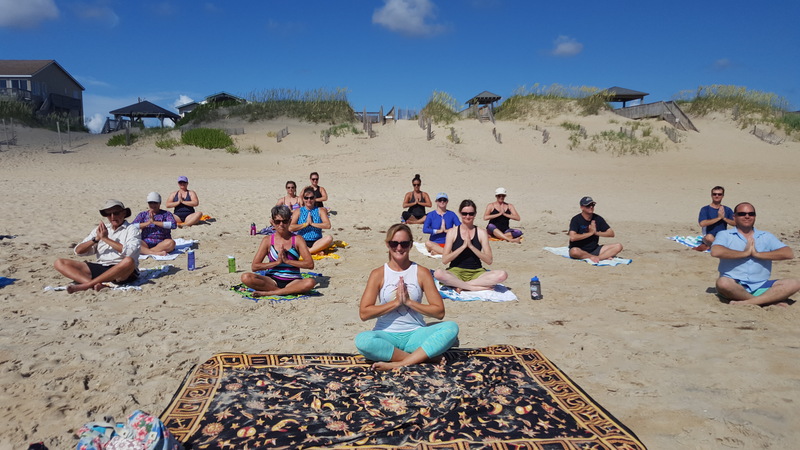 Lisa completed her 220 Hour Teacher Training here on the Outer Banks with Anne Howard at the Amalam School of Yoga in 2014. She has been instructing on the Outer Banks for 6 years and has been lucky enough to practice with and learn from a beautiful mix of local instructors. Being affected and touched in some way by the many different styles of yoga her classes offer a unique blend of what has resonated inside her from her experience. Lisa creates vinyasa flows that are suitable for all levels to feel welcome, keeping classes down to earth focusing on proper alignment, foundation, breath, being present, aware and discovering your fullest potential. On the mat her intention is to help you create a better mind-body connection while reducing stress, increasing flexibility, balance, strength and an overall higher level of mental clarity and awareness in hopes of gradually taking these benefits off the mat with you into your daily life. Lisa has always lived by the coast and draws much inspiration from the ocean and environment, has a passion for the outdoors and connecting with nature. Lisa is certified In Reiki I and II. For the past few years she has been drawn to the chakra system and her classes reflect the transformational wisdom this ancient system offers. She created a 7 week series of vinyasa classes that includes information on each of the 7 main chakras & how they connect to our physical, emotional, mindful and spiritual well being. Lisa feels the journey into yoga is never ending and continues to practice, learn and share all it has to offer every day.